The ChemGrout CG-050M is the most powerful hand grout pump in the industry providing more than 200 psi of injection pressure. 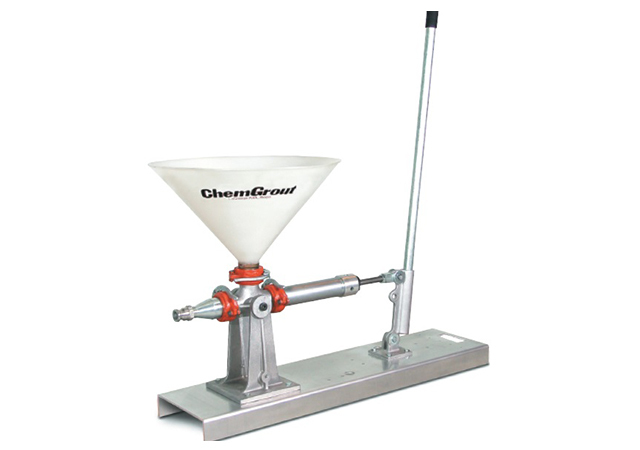 The heavy duty ChemGrout model CG-050M is an easy to use, portable, skid mounted, hand operated grout pump, designed for smaller jobs using high viscosity slurries and most pre-packaged grouts. The CG-050M features a 5 gallon holding hopper and a 2” piston pump that produces discharge head exceeding 150 feet (ideal for vertical lifting). The pump comes complete and ready to use with a free 12.5 foot grout hose and a set of spare piston cups. Its lightweight aluminum construction offers mobility in areas where no air (pneumatic) or electric power sources are available. The manually powered, positive displacement piston pump, disassembles in minutes without any tools for quick cleaning and simple maintenance.